Few alpine-like plants can match this plant in its simplicity of form, hummocks of tiny rosettes of bright green foliage, and clear yellow flowers daintily hovering in the breeze from April to May. When well grown, the flowers stick out in every direction giving it a pincushion effect. Slow-growing but long-lived, this little draba is a true charmer to those willing to provide a smaller habitat to best appreciate its special qualities. Native to the mountains of Turkey and Armenia, this is a gem of a plant that is truly petite. Rock gardeners all over the world appreciate its easy nature and small stature. It can even be found growing in the famous rock garden at Edinburgh Botanic Gardens. 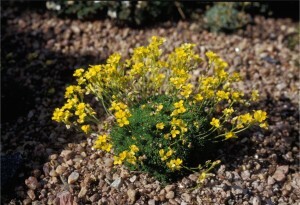 Draba rigida is an excellent plant for outdoor containers such as a stone trough or planting in a wee crevice between stones. It’s also a great choice for rock and fairy gardens where they will not get overgrown by more competitive plants. The flowers are attractive to spring pollinators.